Hanging from the vent on my car’s console is an air “freshener”. It’s empty. The artificially scented liquid that once sloshed around inside and slowly emitted itself into my contained atmosphere merely “masked” the scent of swamp and who knows what else I’ve been dragging from here to there. Tonight as I make a beeline through the quiet, barren roads of the Everglades I am soothed by the most majestic of natural perfumes. It wafts through every pore of my vehicle and fills my lungs with a sweet delicious aroma. As I drive north out of the Everglades I make my way through cattle ranches and orange groves where billions of oranges weigh heavily on sturdy, pliable limbs. I am mesmerized by a seemingly endless array of groves. My headlights remain focused ahead but I am convinced I can see brilliant oranges in my peripheral view in an otherwise black and white landscape. A lone truck passes me heading south bound. A bitter whiff of diesel is smothered by an engulfing gust of the aromatic blooms. The sweet combustion fades into the night with the taillights. Sable Palms, the State Tree of Florida, wave their fan-shaped fronds, helping to spread the enchanting scent of orange blossoms, the State Flower of Florida, across pastures and prairies. For a few short weeks in March, the air will be inundated with the most blissful scent – enticing bees to pollinate the trees and making the low-humidity, mosquito free nights the most enjoyable time to sit on the porch, gaze at the stars, listen to the crickets and let your lungs fill with nature’s perfect scent. Alligators eat turtles. It’s not their number one choice on the menu but they have no qualms about eating them. Sliders, cooters, softshells, snappers. If they can chomp them and swallow them – down they go. But that doesn’t mean they can’t tolerate each other. Alligators have one of the most powerful bites in the natural world. Their teeth are not sharp, nor can they chew, but an adult alligator can exert more than 2000 lbs of pressure per square inch of their jaw. With 80 concrete-like pegs for teeth they can snap that jaw shut with lightning speed and make a delicious meal out of the crunchiest turtle. The problem with turtles is not that they have shells but the style of the shell. Florida Softshell Turtles (Apalone ferox) are quick and pliable. Normally they can squeeze into the narrowest crevices to avoid danger. 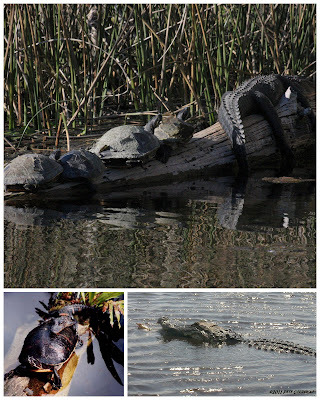 The tenacious turtle in the bottom right photo went for a ride in the jaws of the alligator but eventually escaped. Yes that’s the poor thing’s snout. Sliders and Cooters can grow well-rounded carapaces (the upper half of their shell) which makes eating them all the more problematic. Imagine trying to eat a baseball-sized walnut. In the shell. Your mouth is too small and your jaw is not strong enough. A turtle with a high shell might get captured in the jaws of an alligator but it may be difficult for the gator to chomp down. Often a large turtle will escape with a slightly cracked shell or a tooth mark or two. Alligators have a seemingly unending supply of teeth. Beneath each of the 80 conical teeth is another tooth ready to go, so if one is lost in a turtle-eating attempt, the alligator has plenty more where that came from. In the top photo, the turtles were polite enough to allow the alligator the choicest of basking spots on the log. “You go first. We’ve got your back.” This alligator is far too small to sample any of the four turtles relaxing behind it. Plus feeding time for alligators is usually after sundown. Of course, there’s nothing keeping another bigger alligator from clearing the log of all occupants. It was a bright and sunny day. I was on assignment down on Fort Myers Beach when I got word of a murder at a local hotel. The place is a tourist trap. Neon vacancy sign. Tiki bars and hot tubs. 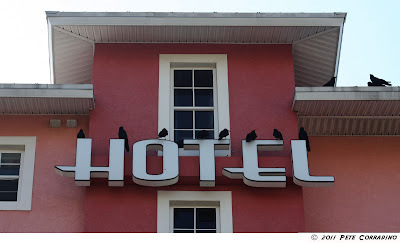 Not a bad place but nothing to crow about. Word was that a murder of crows numbering about one hundred had come to roost and was causing a commotion about a mile away…as the crow flies. Hard to believe. I had my doubts about my source – an old crow with her eye on the comings and goings on the island. I pulled in the lot and stepped out of my vehicle. My informant was right. Perched in a Royal Palm, two black crows cawed a raucous alarm – heckling and jeckling me as I surveyed the property. Each palm that lined the lot was ornamented with black birds. As I stood there counting crows, my eye was drawn upwards towards the crow’s nest of the hotel where a handful of birds perched ominously across the HOTEL sign and roof, flanked by immovable stone owls – scarecrows of sorts and unsuccessful ones at that. I took off my shades and squinted in the bright sunshine, trying to get a better tally of my suspects. The sun-scarred skin around my eyes cracked like a dried up muddy lake decorated with the macabre steps of the crow’s feet at the dance of the dead. There are a hundred crows here. Definitely a murder. Not sure what it means literally or figuratively. I think they’re getting a bad rap. Either way looks like the lunch special at the Tiki bar today is crow. I’m heading west across the Everglades tonight. As the sun sets, an ochre skyline seems to reflect a washboard, sandbar at low tide. It’s hard not to be hypnotized by the patterns of grey and orange bands of clouds. Out of the corner of my eye I see an s-shaped piece of tire on the roadside. And then another. And another. These are not pieces of spent rubber….they’re snakes. I slow from 70 mph, ride the rumble strip and gently pull off the pavement. A snake can be seen in my rear view mirror. Another can be seen ahead of me through the windshield. I park, grab my camera and make my way through the quickly dimming light. Every few seconds the roadside is illuminated by a passing vehicle and I am blasted by bits of asphalt and hot air. These snakes are trying to cross. They have no chance. The one directly in front of me is dead. Its head is flattened. I take picture after picture as I near the gently curved, stocky four foot snake. I lean in to take a close up when the “dead” snake flails itself sideways in my direction. The movement is fast and unexpected. I fall backwards and just as quickly get up. 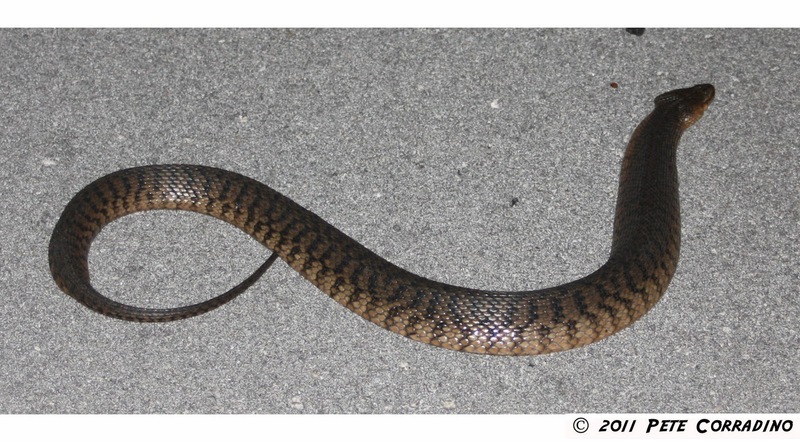 I thought this Florida Green Water Snake (Nerodia cyclopion floridiana) was flattened by a vehicle but it was mimicking the broad, triangular shape of a pit viper. My heart racing, I look around in the grass for other snakes attempting to cross the road. These snakes have nasty dispositions. Not only will they bite when handled, they can give harsh lacerations. They aren’t venomous, but I don’t want to be bitten. The piscivorous Green Water Snake is relatively common in Florida and is often found near the water’s edge. They are known to drop into the canoes of terrified boaters. Cottonmouths usually get the blame. They’re not attacking; they are just trying to escape. The recent and rare winter rain has prompted this migration, but this species lacks the speed to navigate four lanes of traffic. I’ve helped turtles cross this section of road before, but I don’t have the skill or bravado to help move these snakes. I spook a few off the road. My hope is that they recognize the danger and slither back into the marsh. The alternative is a nasty death.